Yep, you read the title right. I really put quinoa in my cookies. Before you turn up your nose, hear me out. The other day I made a quinoa salad for dinner. While we were eating, I told Josh I was in the mood to bake cookies. What’s new, right? 🙂 He requested Toasted Coconut, Toffee, & Chocolate Chip Cookies, but I said what about a quinoa cookie? He looked at me with a blank stare and said…sure! ha! I finished my salad and got down to business. I was determined to create a wining Quinoa Cookie…and I did! 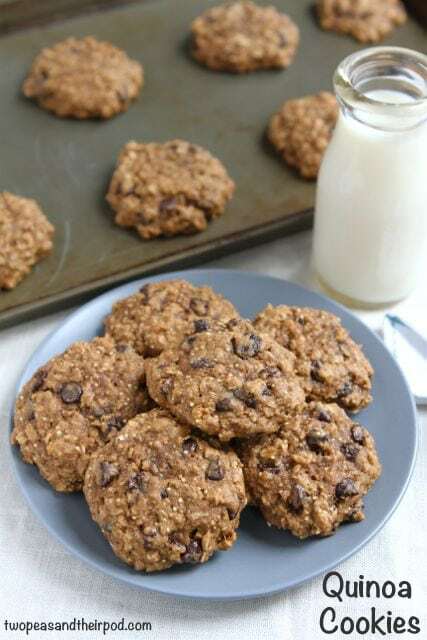 I wanted a thick and hearty cookie so I used whole wheat flour, oats, and quinoa. There is nothing whimpy about these cookies! The cookies are flavored with cinnamon, nutmeg, and ground cloves. I also threw in raisins and chocolate chips. These cookies are packed with deliciousness! Preheat oven to 375 degrees F. Line a large baking sheet with parchment paper or a Silpat baking mat and set aside. In a large bowl, whisk together flour, salt, cinnamon, cloves, nutmeg, and baking soda. Set aside. In the bowl of a stand mixer, cream together butter and brown sugar until smooth, about 3 minutes. Add in the eggs and vanilla extract. Add the applesauce and mix until combined. Stir in the raisins. Slowly add the dry ingredients into liquid ingredients and mix until combined. Stir in the oats, quinoa, and chocolate chips. I recently had couscous pastries and I was blown away by the texture. I can totally see how quinoa would totally rock! These look marvelous! These sound super-good. I love the idea of more texture in a cookie! Good thinkin’. Hey, I NEVER turn my nose up to a cookie! I bet the quinoa does provide a really great texture. Love these Maria. I’ve been nearly living on quinoa lately. These are great! Oh yum! 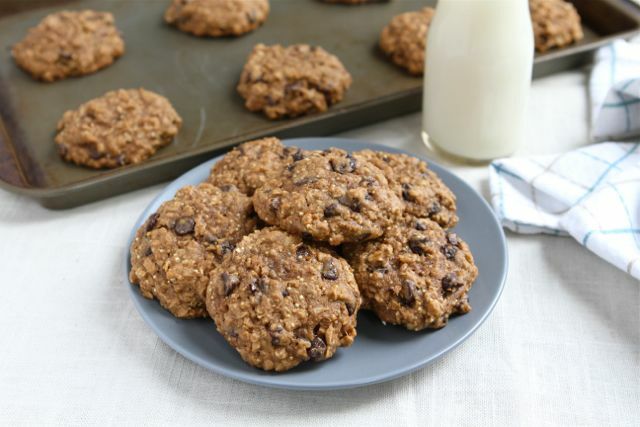 I am totally in the mood for a thick, chewy, hearty cookie. 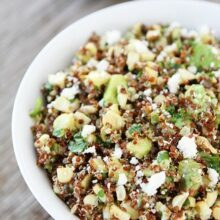 The addition of quinoa sounds like genius to me! I love that you used cooked quinoa in these! So many quinoa recipes I see call for quinoa flour or quinoa flakes, which I never have…I’ll definitely be trying these! I love putting quinoa in cookies! It adds a great texture AND plenty of nutrition. How can that be bad? This is FANTASTIC! Last week I was looking for a quinoa cookie recipe but couldn’t settle on one, so I didn’t make them. Now I know I have a great recipe to try! Thank you… great weekend to you, too! This sounds so healthy. I wouldn’t mind eating all the cookies myself! Happy Friday! A meal in a cookie…? I love quinoa for a breakfast cereal, as a salad, side dish, now for cookies! We are making these right now..so excited to try it! I am going to substitute craisins for the raisins b/c I love ’em. Thanks for the inspiration to bake. Lovely idea with the quinoa! 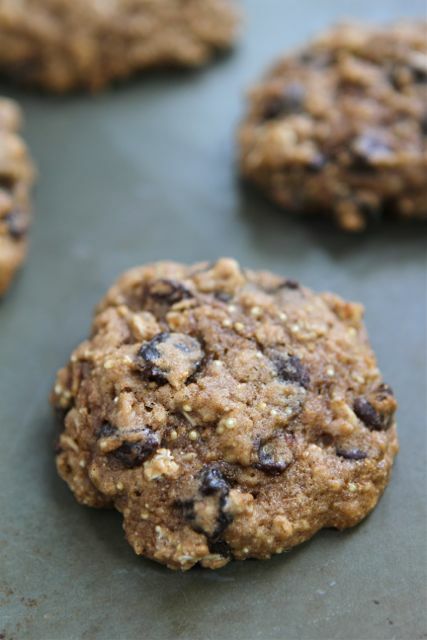 Added protein definitely can’t hurt and I have to say, with or without the quinoa, this cookie looks fabulous! yum! those look great, just like all of your recipes! These are definitely not whimpy cookies. They look so delish and healthy too. What a genius idea!! Since they have quinoa, can I have them for dinner? 😉 I will be trying these this weekend for sure! Brilliant! 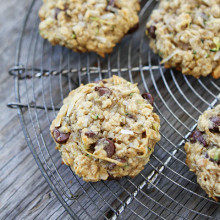 I adore quinoa, but never have thought to put it in a cookie! I am so intrigued by these cookies, Maria! I’m sure I would love them. I made these cookies this afternoon. They are absolutely delicious!! Very moist and a nice texture. Everyone loves them!!! You know what I’m going to say, each time I saw a recipe made with quinoa I started feeling so proud about my country and my roots. I have been wanting to try quinoa in baking and am glad to hear that it worked so well. These sound so hearty and packed with flavor. I love quinoa cookies. I think the cooked quinoa makes the cookies bake up lighter than you would expect. I can’t wait to try this recipe. i love making quinoa cookies! i don’t think it’s weird at all! those look so delicious! thanks for sharing! Very flavorful recipe. Thank you for posting it! I just took mine out of the oven. The quinoa seems to be lost in the batter. Next time I may add 3/4 or whole cup of cooked quinoa instead of just a half cup. I made these tonight and they were amazing! Everyone loved them! Thanks for the recipe! So weird, this post just hit my Reader today….3 posts of yours at once. What a fun twist on cookies! And healthy! Oooh, these look fun! I would never have thought about putting quinoa in cookies. Great idea! I have been looking for a good “healthy cookie” recipe to keep on hand for quick breakfasts or snacks. I will have to give these a try…maybe even adding a scoop of protein powder! SHUT. YOUR. FACE. I. LOVE. THIS. Awesome idea! These look like the healthiest cookies in the world. Guilt free!! These look awesome! Why not? Oatmeal cookies are old news. I’ll take the whole plate please! I mean, since they’re made from Quinoa I can eat the whole plate and not feel guilty, right? Oooh I love a nice, hearty cookie. These look great! I would love to try these, do you think there is a gluten free flour that would work instead of the wholel wheat flour. I have a son with Celiac Disease and these would be great snacks for her lunch box! I am sure gluten free flour would work. Let me know if you try it! Awesome looking recipe… must try!!! Quinoa, applesause and chocolate!!!!!!!! Healthy and decadent at the same time…thank you!!! Made these this morning, omitted raisins. Since the quinoa was hardly noticeable I think I could sneak a bit more in there next time. Ate some for breakfast. Then again at lunch 🙂 Great recipe, thanks! have you tried to substitute date sugar or evaporated cane juice for the brown sugar at all? Healthy cookies?! I’m all over this!!! I just love ur blog!its always entertaining & the bits and pieces u put in here & there about fmly just lightens the mood:))WOW! As for the cookies, I just love the fact that uv gone all healthy. & 2ndly the cookies look super yummmyy. I have a baking sell blog that does pretty well. Made this 2 weeks ago and have already made my second batch. We love them in our house! I added extra quinoa and halfed the sugar. I also replaced the rasins with craberries and added a large handfull of coconut. They are soooooo very tasty. Thanks so much for the recipe. Made these for the first time and my husband loved them!!!!!! Glad you liked the cookies! Great adaptations too! These look AMAZING! I just got a bunch of quinoa so I will be trying them today! Yay! I’m thinking about putting a little less sugar in the cookies… would you have any idea or could you possibly guesstimate how only using a 1/2 cup of brown sugar could impact the cookies? Would they be flatter? I love quinoa but never thought to bake with it! Looking forward to giving this recipe a try. these are simply amazing!!!! i honestly thought they wouldn’t come out that good bc the batter was to “wet”. im used to the “drier”, “fatty” recipes, so glad i was wrong. what a nice, welcomed change! Just made these and they are delicious!!!! 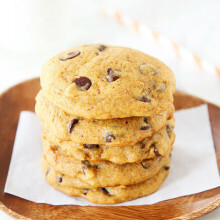 Made these with dark chocolate chips and substituted canned pumpkin for the applesauce. Added a little extra sugar as first batch seemed a bit bland. Half the batch I omitted the raisins, while other half used craisins. They are rich and I just love that they’re so healthy! 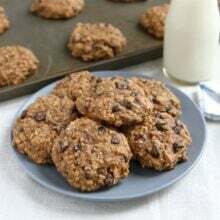 Just tried the cookies – really happy with them…I cut the sugar back to 3/4 (will likely reduce, personal choice), left out the chocolate chips (blood sugar issues) and used regular oats (what I had) and cut them up a bit with my food precessory – hubby approved: and that is saying something! Thanks for a great recipe! Just checking — do you really mean 2 tablespoons of vanilla extract? These look delicious and I don’t want to mess them up! Great looking cookie, can’t wait to give it a try. Pingback: Xlear Australia Blog » Surprising ingredients that are perfect for baking! 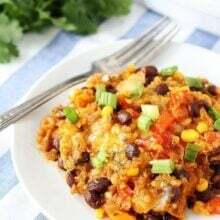 Pingback: Running & Losing Weight & Quinoa? | just try it, kids! You can add more applesauce if you want! I have a dumb question…is the quiona 1/2c before cooking or after cooking? Do you have any nutritional info for this receipe? How many calories is in one cookie? I was wondering what the calorie count is per cookie. Have you calculated? The cookies sound great!! I have never used quinoa, but my mother-in-law gave me some. Didn’t know what to do with it…I can’t wait to try this recipe!!! I’m going to add walnuts or pecans next time too! Oh yes! I did only 1/2 Tbsp vanilla. And I used Rogers brown cane sugar. Quinoa is healthy as a whole grain seed, and whimpy SB wimpy. Pingback: Cookies for Breakfast! | Jo, My Gosh! I can’t get my boyfriend to eat breakfast to save our lives, but have found that breakfast in cookie form goes down pretty easily. I had about half the oats and substituted pumpkin for the applesauce (since I had some in the fridge) and WOW. These are REALLY, really good. Mine came out thick, soft and cakey, and didn’t spread much. I added some coconut and flax seed just to “fill” the space left by the oats. Quinoa in cookies.. who knew! Thanks! Two tablespoons of vanilla extract? Is that correct? do you have calorie content for your recipes?? My teenagers and their friends and friends parents LOVE when I make these. Most often I skip the raisins per their request, but they are amazing. Thank you!! Will it work if I half the sugar? I feel like there is enough sweetness in all the rest of the ingredients. Or does the sugar serve another purpose besides sweetness? I haven’t tried the recipe with less sugar.